Whatever industry a business belongs to, workplace safety and health is an issue that should never be set aside and should always be prioritised. Auto mechanics or workers in an automotive industry are among those who face different kinds of dangers in the workplace. From spills of engine oils and hazardous chemicals to injuries caused by mistakes in handling mechanical tools in the repair shop, accidents can happen anytime. You may not expect to see containers filled with hazardous chemicals in an auto repair shop, but they are there. Different hazardous substances are needed for special repairs that require replacing harmful liquids in the engine parts. If the workers get exposed to these chemicals, that can present a serious health issue. Those that work in the automotive industry are aware of these risks and take care, but the cases of exposure still happen. HOW DO WORKERS GET EXPOSED TO THE HAZARDOUS CHEMICALS? by bringing the dangerous chemicals in contact with the worker’s skin. Another way auto mechanics can become exposed to these harmful chemicals is when the engine parts that contain these toxic chemicals start to experience wear and tear. This causes the harmful chemicals to be released into the environment thereby polluting the air. The worst part is – this release can remain entirely undetected until it’s too late. Poor ventilation structure for an automotive workplace is can cause extremely dangerous issues with the workshop air quality. There is no escape from harmful gases or floating asbestos that might be released into the air while the mechanics are at work. In this way, the concentration of these toxins rises and the workers are affected. The effects of unsafe exposure can manifest immediately or over a period of time. Inadequate working uniform can also increase the danger of being exposed to the harmful chemicals at the workplace. 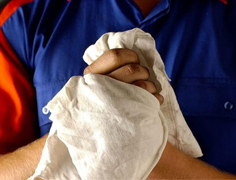 This can be prevented by ensuring your workers have high quality uniforms. malfunctioning organs in the body like the lungs, kidneys, the nervous system and the eyes. The nature of the symptoms experienced and the health risks posed to the mechanics depends on the extent of exposure to the harmful chemicals. 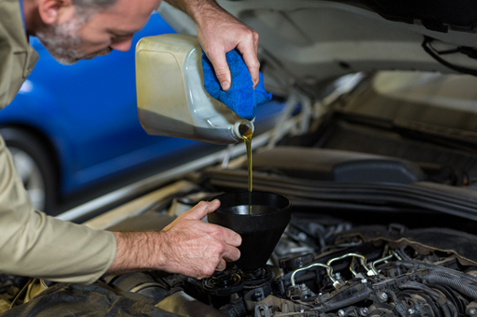 Auto mechanics are also faced with the risk of exposure to harmful heavy metals which are among the contents in the regular brake fluids, detergents, lubricants, paint, grease, solvents, metal cleaners and the radiator coolants. These chemicals are known to be potent poisons that can have fatal consequences if they are not carefully handled. Auto mechanics can be exposed to asbestos while they work on the brake drum of cars, as some brake pads contain asbestos. The asbestos dust is easily inhaled unknowingly by the workers. The asbestos dust has been known to be the major cause of mesothelioma, a severe form of cancer. Did you know #asbestos exposure can cause pleural #mesothelioma and lung cancer? Mesothelioma can happen when the asbestos dust is inhaled; it finds its way down to the lungs and sticks to the pleura, a membrane that lines the lungs. Detecting the early signs of mesothelioma is not very easy because the initial symptoms have similar features with other commonly experienced illnesses. Sadly, the ailment does not manifest and can remain dormant for as long as 30 to 50 years after exposure to the asbestos dust. 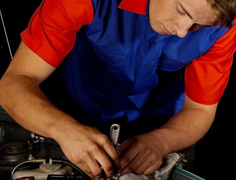 Many health complaints made by auto mechanics have turned out to be mesothelioma. The following car parts are known to contain asbestos. How Do the Mechanics Become Exposed to Asbestos? An exposure to the harmful asbestos happens when the car parts containing this harmful substance undergo wear and tear. The asbestos is released when a mechanic removes the faulty parts to make a replacement. Further pollution of the atmosphere can be caused when vacuum cleaners are used to clean up the work area after the repairs have been finished. The fine asbestos dust is then blown out from the vacuum cleaner, spreading through the air. An estimated area of about 75 feet can become contaminated with the asbestos dust when it is released into the air. This is potentially dangerous to both the mechanics and their customers who come into the workshop. Asbestos dust can get into the body through inhalation or by ingestion if it has settled on the hands or food. It is easy for asbestos dust to stick to the hands because of the common use of grease while carrying out repairs. Grease catches the asbestos dust and holds it in place until it is washed away. The mechanics’ families and friends are also not exempted from this danger because asbestos can linger on their clothes until they get back home. Therefore, all automotive parts must be thoroughly cleaned in a safe way. Irregular breathing – any mechanic experiencing irregular breathing should seek immediate medical attention because this might be a result of the asbestos deposit on the lungs which can develop into mesothelioma. Swollen face and arms – This is usually an indication that the cancer is spreading to other parts of the body and should never be overlooked. Urgent medical attention should be sought immediately. Chest and back pains – Many people overlook this symptom because it is regarded as a normal occurrence inactive men who carry out physical work in their workplaces. The chest pain is mostly as a result of a buildup of fluids on the right side of the lungs. The buildup causes a pressure which results in the pain that is felt. The most effective way to stay protected from the asbestos dust is to use protective suits and respirators while working in a place where the exposure to asbestos is possible. After work, the protective suit should be properly cleaned and carefully stored away and the workplace cleanup should be done in a way that avoids the dust spreading. Antiknock agents are commonly used by mechanics to improve the fuel efficiency of the engine and the general capacity, as well. The main constituent of the antiknock agent is methylpentadienyl manganese tricarbonyl (MMT). Beside it, ketone solvents, like methyl isobutyl ketone, have also been identified as the constituents. These are harmful compounds that can cause health issues ranging from eye irritations, shortness of breath, headaches, dizziness, and nausea. MMT has been reported to be a common cause of liver and kidney malfunctions. All these measures require from you to have a good and ready First Aid Kit or even an entire station. 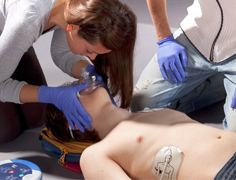 Additionally, it is important to have at least one person who is trained in First Aid. Compliant with all Australian laws and regulations. Regularly stocked and updated. Easy to use, even without help from others. Contains sterile saline solution. Manganese, on the other hand, is another potentially dangerous compound. 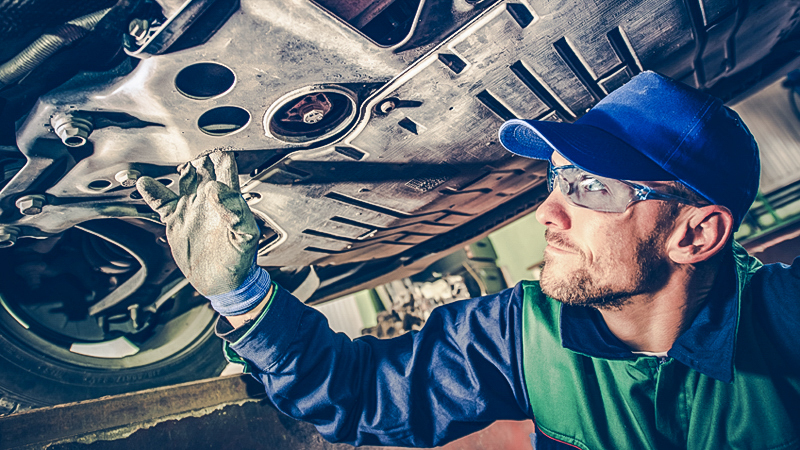 Auto mechanics and welders are at a risk of suffering from central nervous system health issues when manganese finds its way into their bloodstream through the lungs when inhaled. Manganism is the clinical term given to the neurological syndrome caused by a prolonged unprotected exposure to manganese. The symptoms of Manganism are similar to those of Parkinson’s disease. The long term effects cause impaired neurological functions. The symptoms begin to manifest after about 5 to 20 years of unprotected exposure to manganese. There is no known cure that is reported to be effective in reversing the effects of lead poisoning. Its symptoms include causing damage to the neurological system of the affected person. Lead poisoning should be avoided because a large portion of this poison inhaled remains in the lungs. Lead causes: muscle pains, diarrhoea, abdominal discomfort, depression, constipation etc. These are common symptoms of other illnesses and this is a reason why the detection of lead poisoning is very hard and people affected get misdiagnosed in many cases. Workers in the auto-mechanic workshops are in danger of suffering from neuromuscular, gastrointestinal, and neurological health issues. Numbness and general body discomfort. Unprotected exposure for long periods causes a visible blue line to appear on the gums and a bluish, black edge to the teeth. Harmful solvents like benzene, toluene and xylene can cause haematological distortions in the human system. Almost all forms of solvents are toxic and this poses a great health risk to the workers in the automotive industry who use these solvents daily. Diesel fumes can also cause severe health challenges to mechanics; they can suffer from breathing problems like asthma, allergic reactions, and compromised immune systems. Brain damage has also been identified as one of the potential effects of these poisons. When mechanics experience any form of irregularities in their breathing, they should seek immediate medical attention for a proper evaluation. Did You Know That Not All Cleaning Techniques Are Safe? The Occupational Safety Health Administration (OSHA) requires all automotive industry workers to handle all brakes with care, considering that all brakes may contain asbestos. The following cleaning practices used to clean brakes should be discontinued because they are known to promote the release of the harmful asbestos dust. The use of a vacuum cleaner is not effective enough in containing the released asbestos dust. The use of compressed air pressure to clean out the brakes drum. There are better and safer ways to clean machine parts in an automotive workplace. Some of these parts may have come in contact with hazardous chemicals and therefore should be properly maintained and cleaned. Even chemical residues can still cause harm to workers and therefore, need to be completely removed from any machine, equipment, or surface in the workplace. This is why machine parts need to be cleaned and washed professionally – not with the employees’ bare hands. 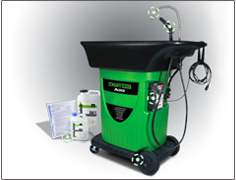 Toxine-free, eco-friendly, efficient way to dispose of chemicals in any workshop. Protective and industrially cleaned. Rent appropriate uniforms for all employees. Reusable absorbent wipes, perfect for detailing. Help avoid touching with bare hands. There is an easy, safe, and eco-friendly solution to this important issue! Alsco’s Ecosafe Washer is the safe, economical solution to cleaning oils, greases, and potentially hazardous chemicals of mechanical parts without the need for harmful solvents. Alsco offers products that would not only rid your machine parts of oil and grease but also keep your health and safety in check. Alsco’s Ecosafe Washer is an aqueous based parts cleaner. Unlike the solvent cleaners, it is NOT harmful to the user or the environment. Now, your staff no longer needs to breathe in vapours off solvents and immerse their hands into harmful chemicals to clean equipment parts. Protect your workers. 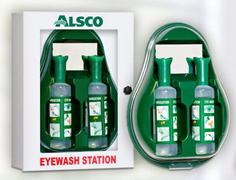 Call Alsco today and let us help you find green and healthy solutions for your industrial workplace.